Prior to entering the seminary, Fr. Nick obtained his B.A.Sc. from the School of Engineering at Simon Fraser University in 2005. Before ordination, he spent several years in formation with the Missionary of Charity Fathers, serving in various ministries in Tijuana, Mexico City and Rome. During this time, he obtained his S.T.B. from the Pontifical University of Saint Thomas Aquinas. Fr. 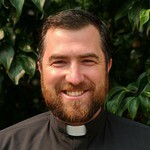 Nick was ordained a priest for the Archdiocese of Vancouver in 2013. Before pursuing further studies, he served in several parishes in Surrey and Richmond. Fr. Nick obtained his S.S.L. from the Pontifical Biblical Institute in 2018. As part of this program, he also studied at the Hebrew University of Jerusalem. Fr. Nick is excited to join the dedicated and talented communities at St. Mark's and Corpus Christi Colleges, teaching in two areas that he is passionate about, Scripture and Mathematics. In teaching the Bible, Fr. Nick hopes to share the complexity and beauty of the Bible and encourage students to live their lives rooted in God’s Word. While teaching Mathematics at Corpus Christi College, he looks forward to helping students grow in their confidence and proficiency of what Galileo called the “language” of the universe.